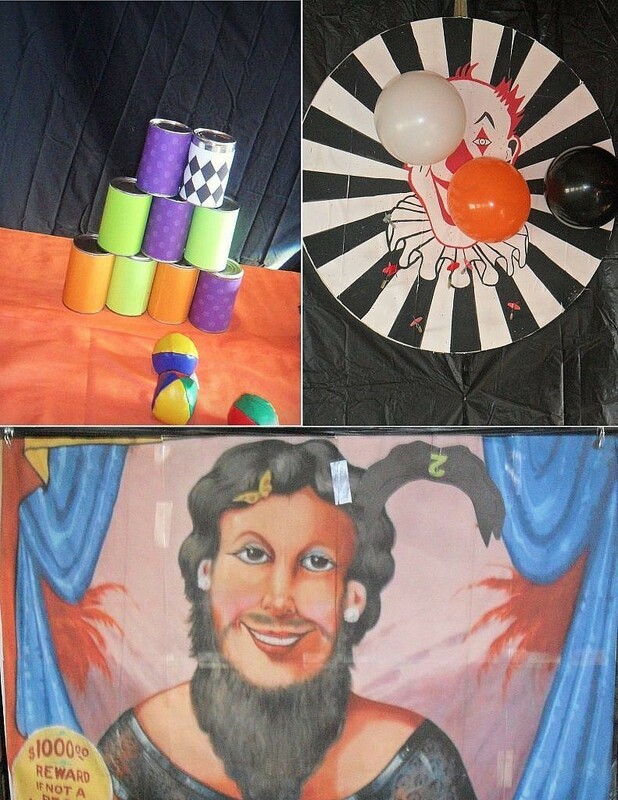 Host a creepy carnival-theme Family Halloween party full of fun food, games, and decorations. 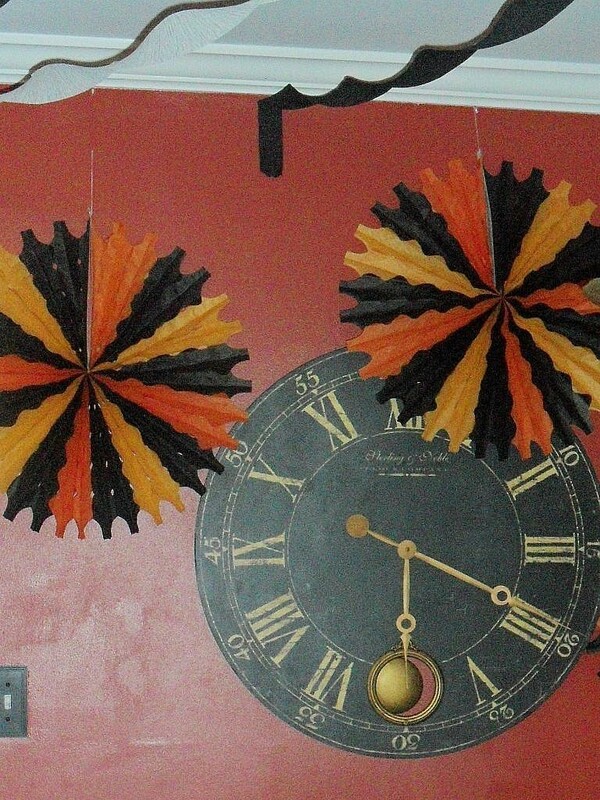 You don’t need a big top to throw an epic creepy carnival-themed Halloween party. 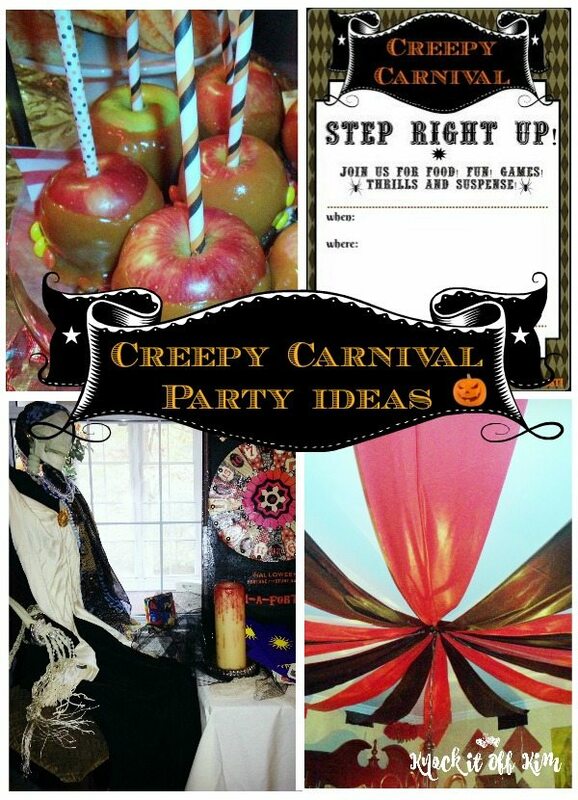 With yummy carnival fare, simple, inexpensive decor and fun party games, your creepy carnival is guaranteed to be a smash hit! 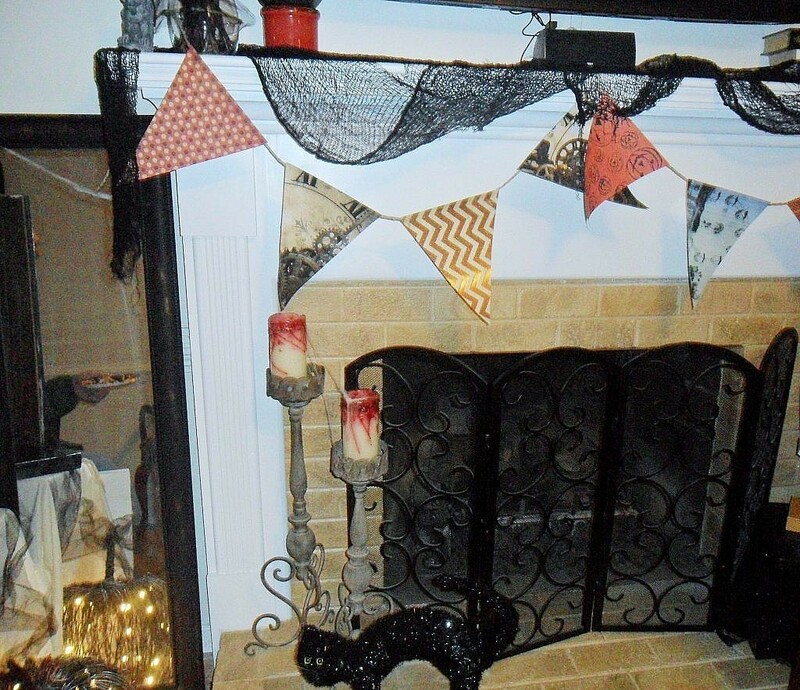 Our Family hosts an annual Halloween Party every year, and we plan the event for months before, making sure every detail is just right. Our whole family comes together and helps out making props, cleaning, cooking – it’s a family affair, and it’s an event we look forward to all year! 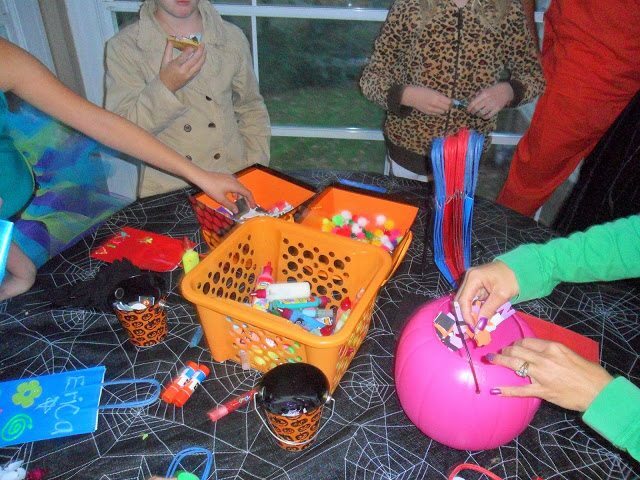 This year we hosted a Creepy Carnival Party. 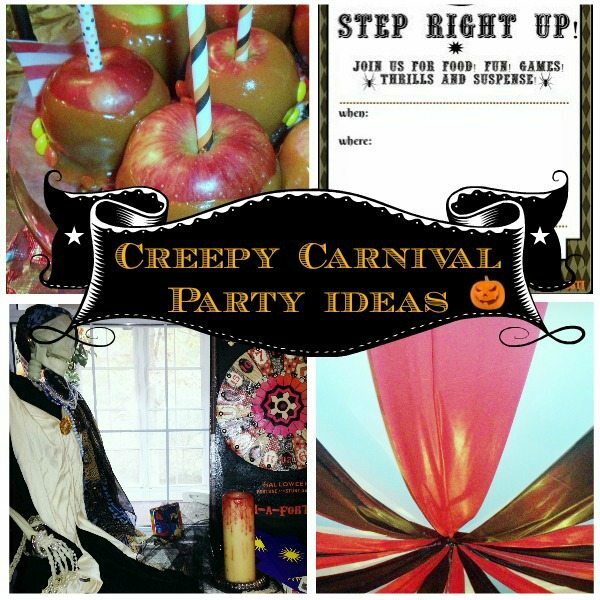 If you are throwing your own Creepy Carnival party this Halloween, read on for tips, freebies, and inspiration galore! 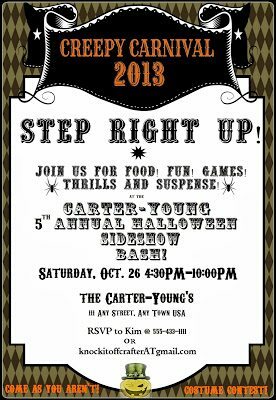 As with any party, you have to set the mood from the get-go – it all starts with the invitation. We manage most of our guest list through Evite, but I always like to work up a paper invitation for those guests that are new to the party. A date-less version is available to email list subscribers on my Get the Goodies page. If you aren’t a subscriber, you can sign up here for free! If you’re looking for something even scarier, these Carn-evil ones are also a great option. 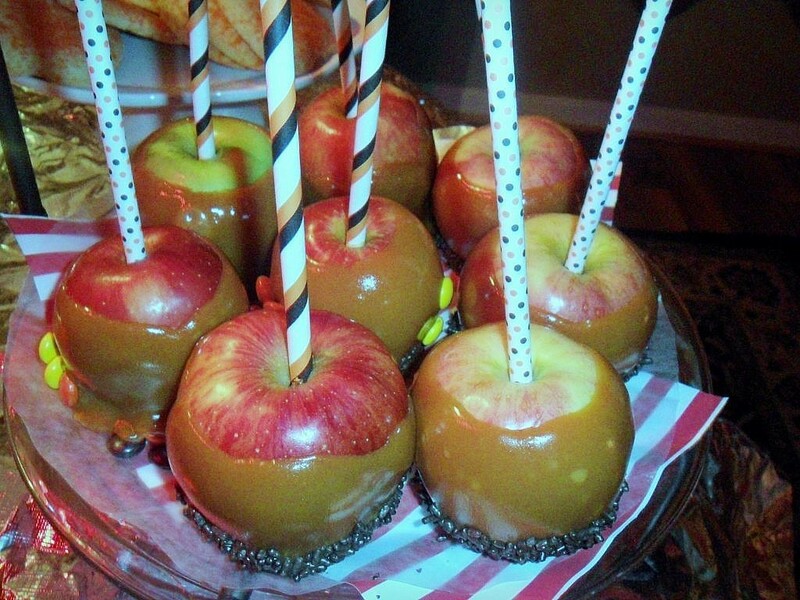 When planning food for a Halloween Creepy Carnival think midway treats like popcorn, corn dogs, caramel apples and cotton candy. Keep the dinner menu simple and serve carnival fare with a Halloween twist – adorn with spiders and creepy crawlies for an extra spooky meal! I almost always serve a signature, themed punch. This party was no exception! 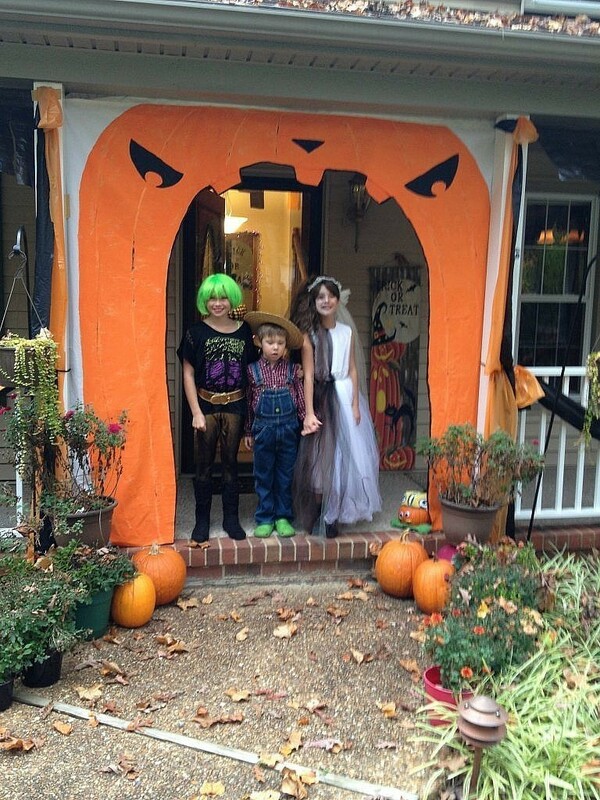 The kids loved our Witches Brew Punch! An assortment of canned sodas, bottled water, wine and beer rounded out our cold beverage selection. 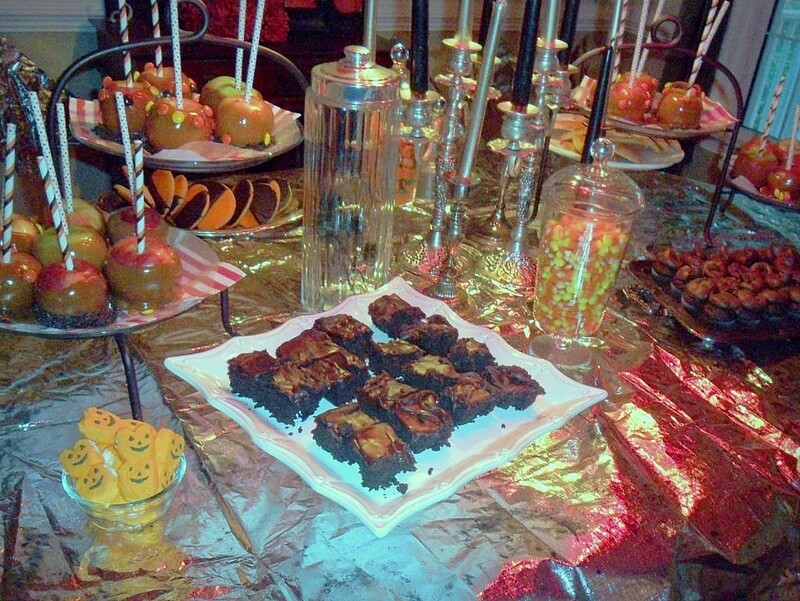 Load your dessert table frightful treats – chocolate cupcakes, frosted brownies, caramel apples and sugar cookies. Pumpkin shaped Peeps are a fun addition! Begin your night of fright by entering through the mouth of a DIY Jack-o-Lantern arch – It’s almost like entering a haunted carnival ride! 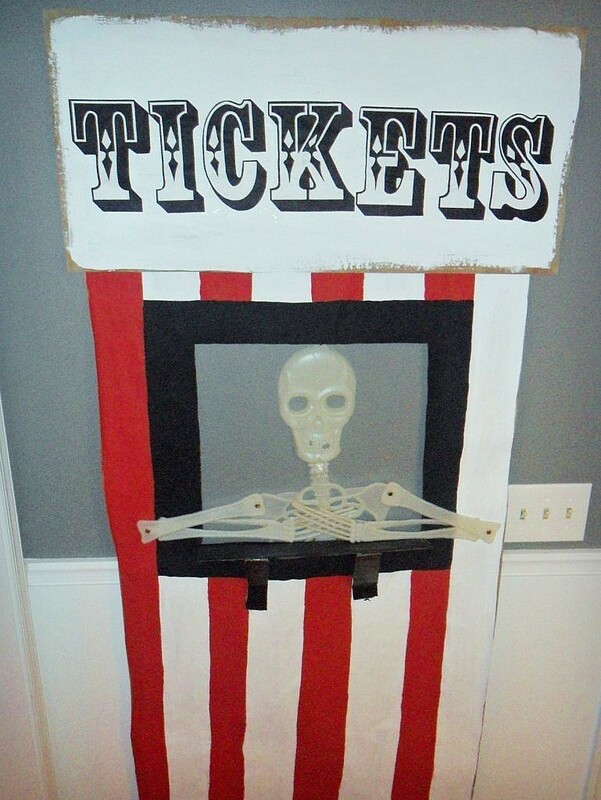 Inside, a creepy ticket master waits to stamp your ticket – there’s no turning back now! 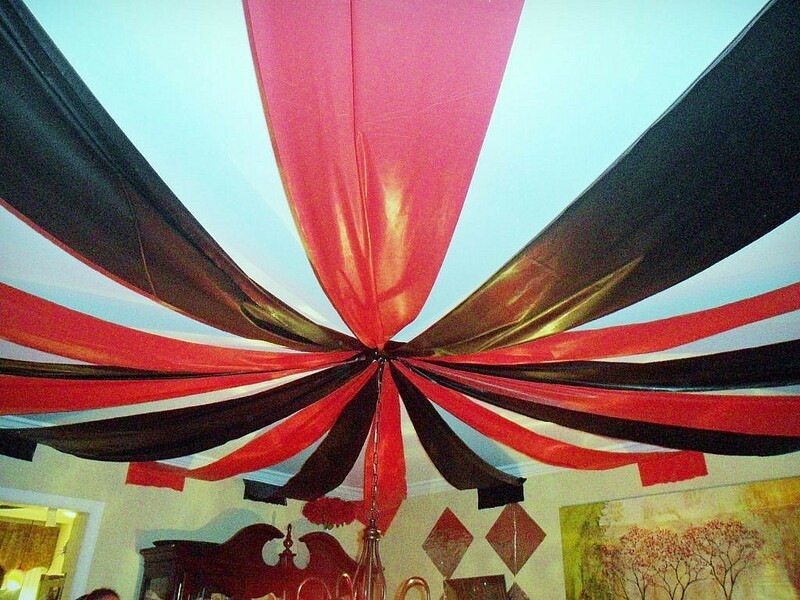 For less than $5 you can have your very own Indoor Big-Top! 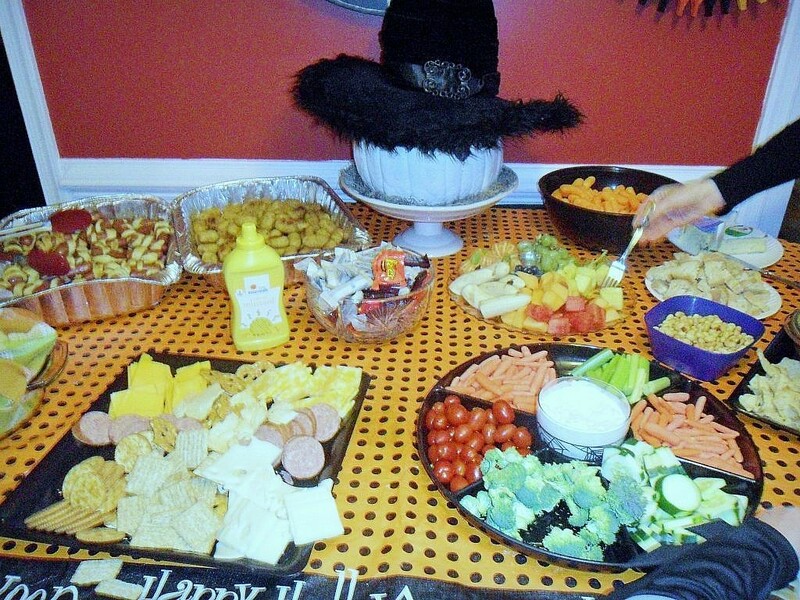 Purchase inexpensive plastic tablecloths and cut them into 30″ strips. 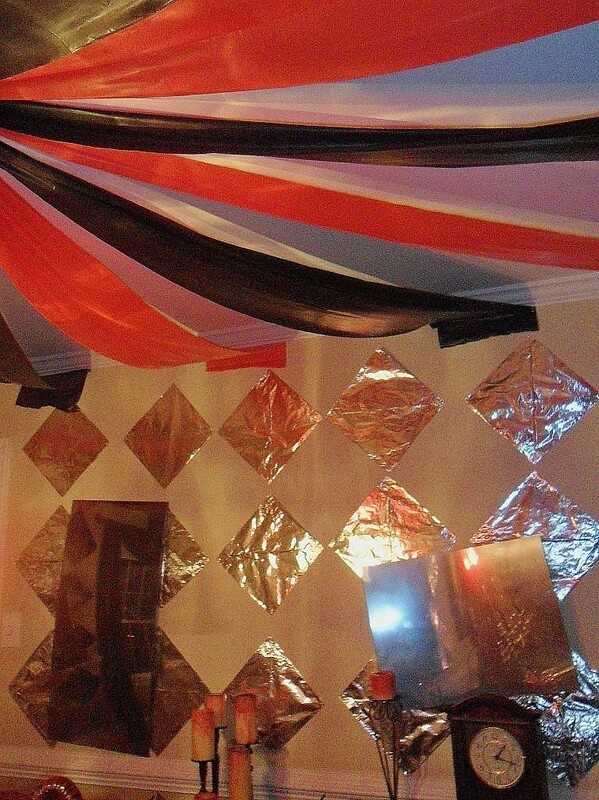 Find a central point in your room and tack alternating color strips with thumbtacks. Let the strips bough slightly and tack the other end to the edge of the room. 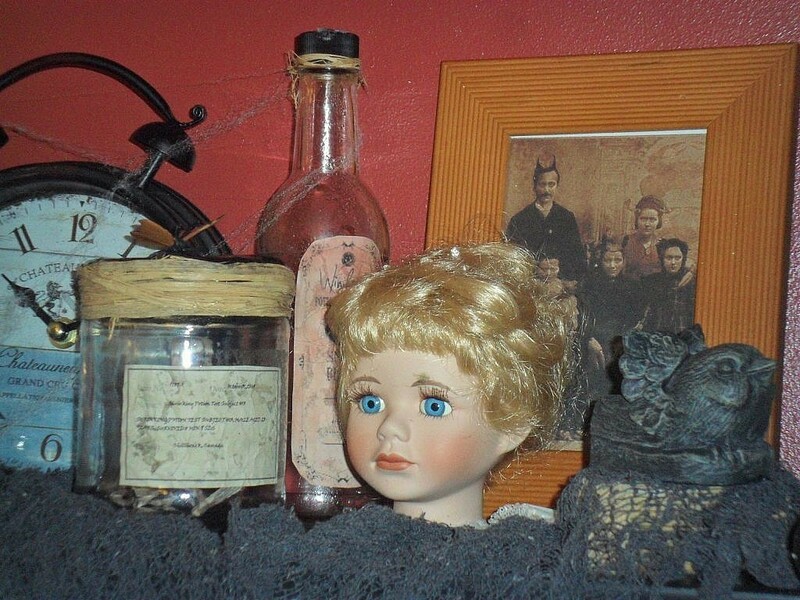 Find both the strange and macabre in a Cabinet of Curiosities. 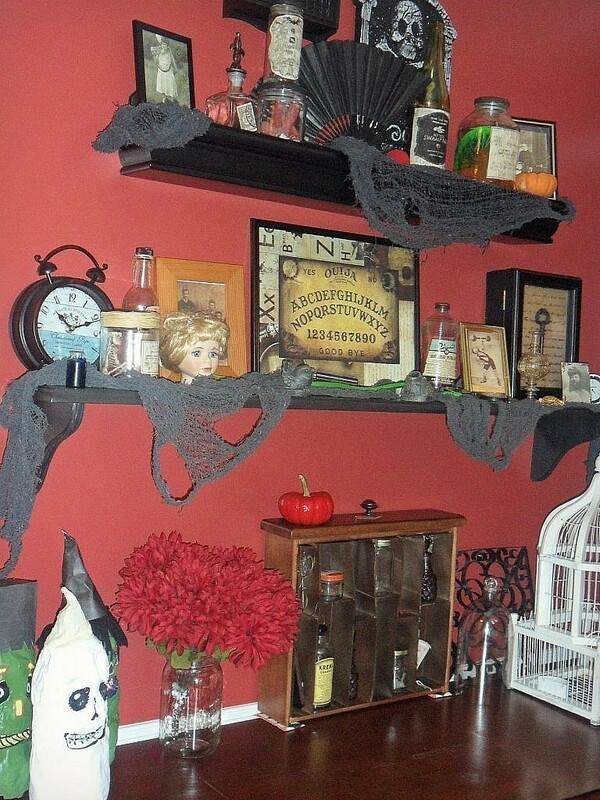 You can find ideas for filling your own in this post on how we made our Cabinet of Curiosities. 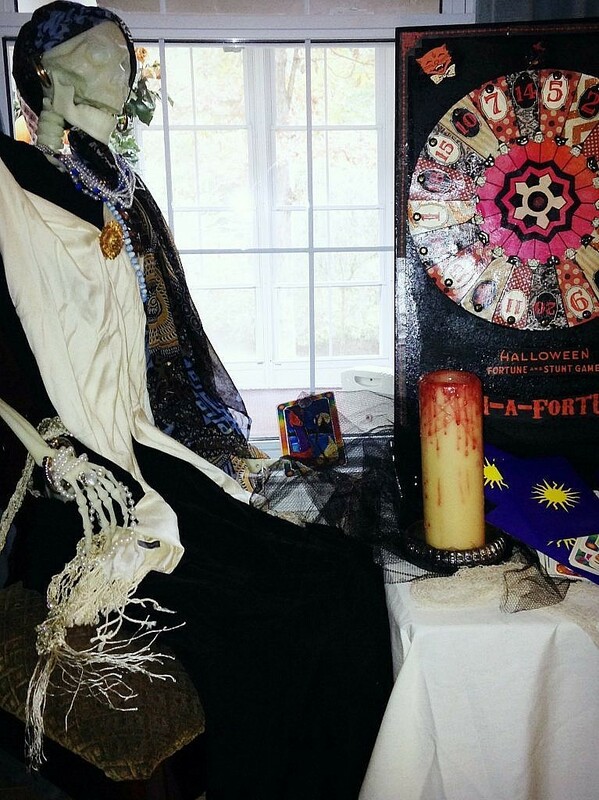 Guests can tap into their mystical side by visiting our fortune teller. 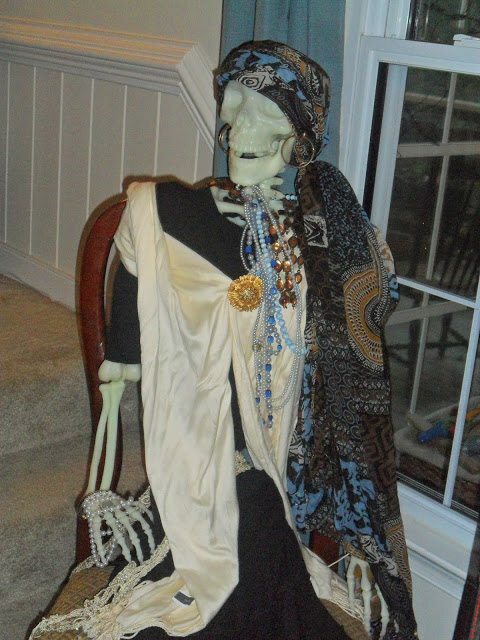 Dressed to tell you all in bohemian pieces, a flowy skirt and colorful scarves, all topped off with a heavy dose of gold and silver jewelry, she offers personal tarot readings. 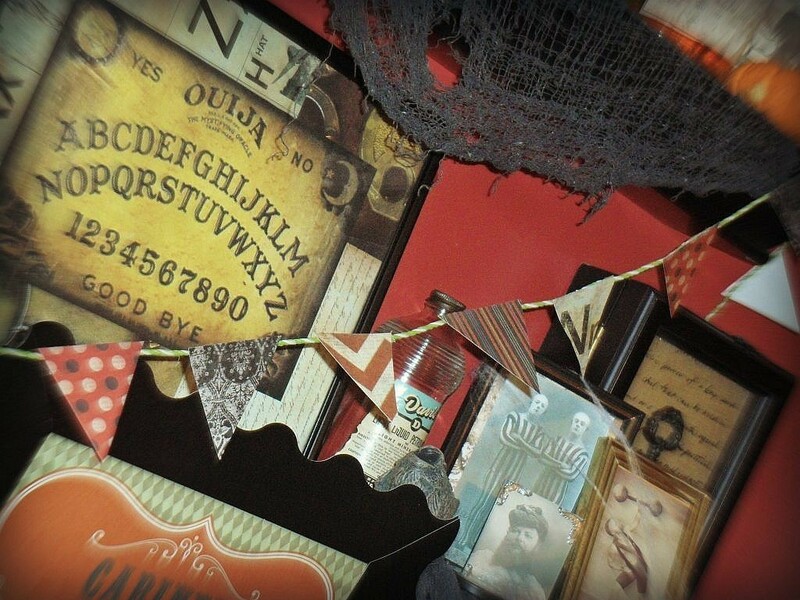 Or, if playing the game of chance is your thing, take a spin on the DIY vintage-looking Spin-a-Fortune teller! (Tutorial to come)! See the activities section for more on Spin-a-Fortune. 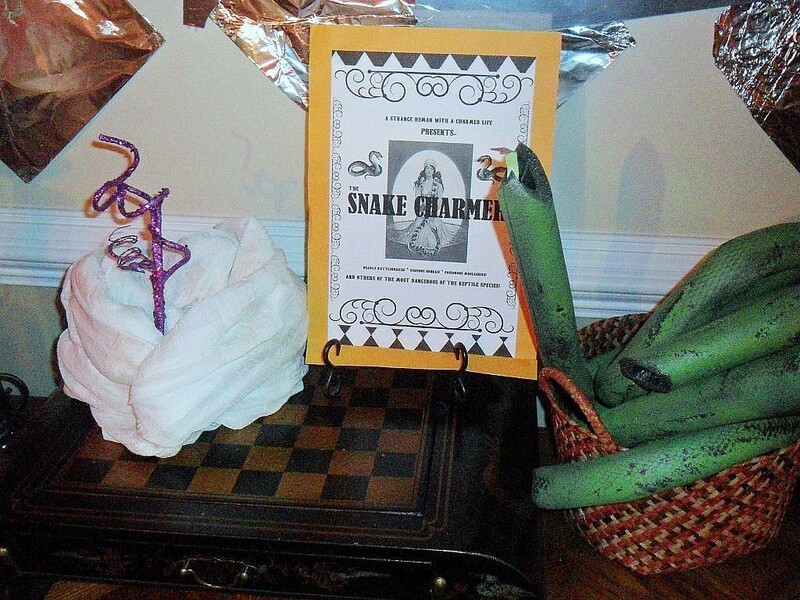 Be mesmerized by the talents and the danger of our resident Snake Charmer. 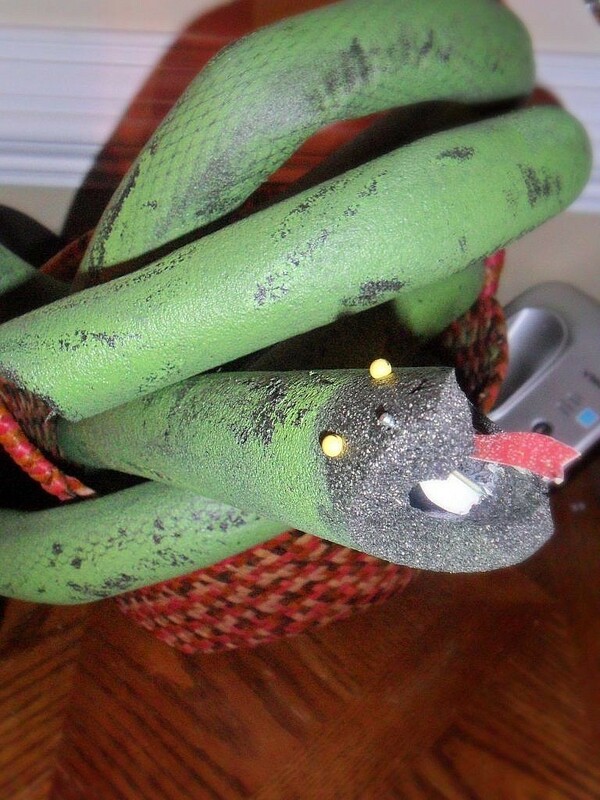 The snakes are an easy DIY using spray painted pipe insulation tubing! Look here for directions. A hall of mirrors is a must for a creepy carnival. 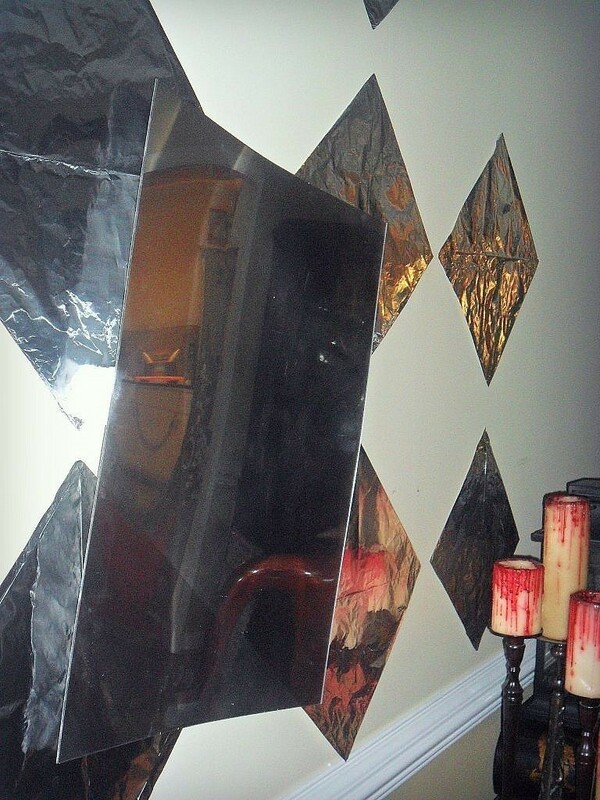 Tape pieces of aluminum to the walls in a fun pattern or make mirrors from mylar or thin plexiglass and mirror spray paint. Attach to the wall with a slight bend using 3m picture strips to give the gazer funny reflections. Will they be tall and thin or short and wide? 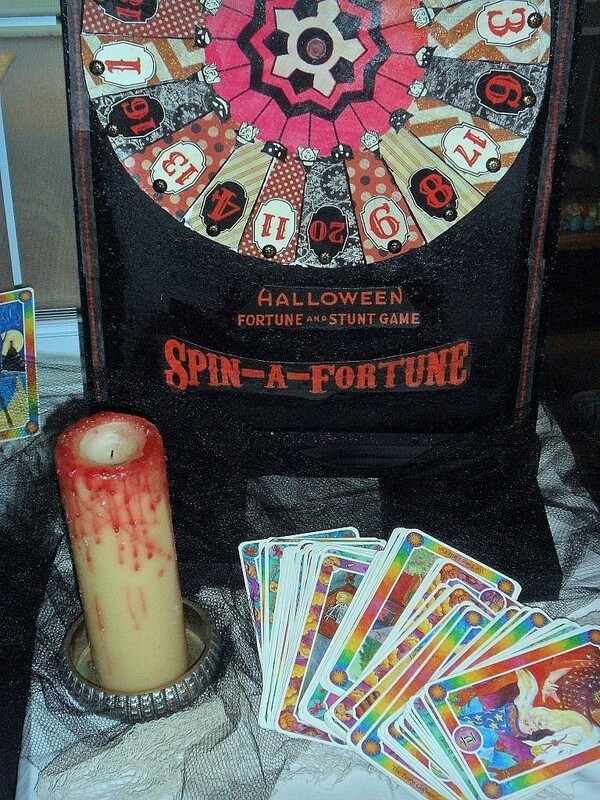 If playing the game of chance is your thing, take a spin on the vintage-looking Spin-a-Fortune teller! (Tutorial to come)! Each spin corresponds to a number. Each number relates to a family-friendly fortune teller saying. My fortune – “If you take a bath once a day folks will think you’re all okay!”. Good to know! You can download a list of the kid-friendly fortunes here. We also played a fun game of donut bobbing – always a HUGE hit – you might remember that game from our 50s Sock Hop! Our younger guests played games over and over again for two hours straight! 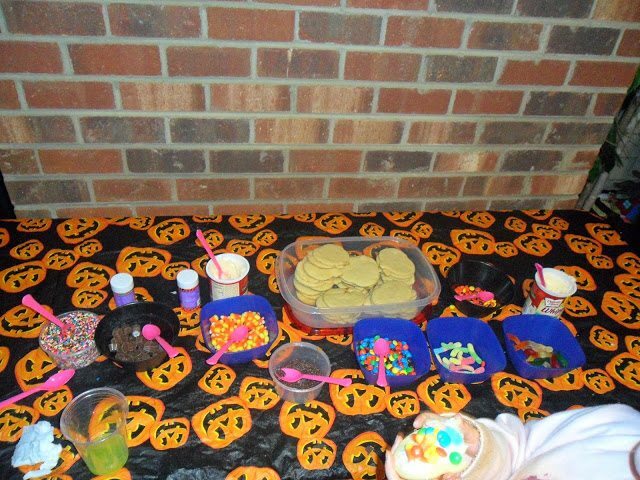 This party was a HUGE hit and fun was had by all. 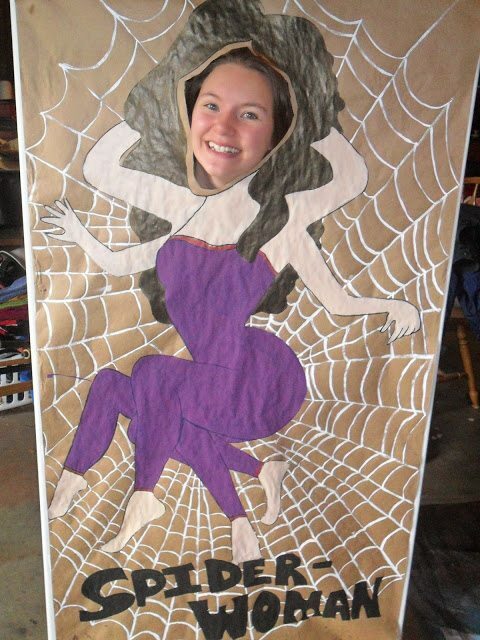 We are already thinking ahead to our theme for next year!